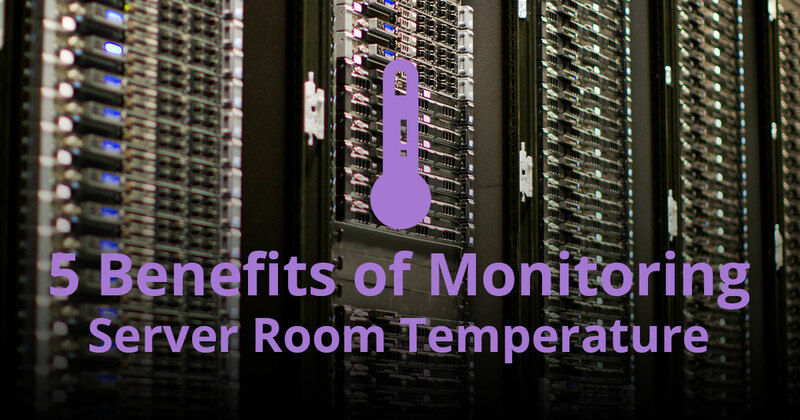 If you are already monitoring your server room temperature, then good job. You may already recognize the benefits of temperature monitoring. If you are not, then this post is for you. As I am sure you are aware, servers and networking equipment can create a lot of heat, especially when enclosed into a room with dozens and potentially hundreds of other devices. I am also sure you are aware of what heat can do to your equipment that is forming the backbone of communications and productivity for your business. Decreased lifespans of equipment, failures, replacements and the inevitable downtime and loss of productivity mean the loss of revenue for your business. You may already know why server room needs cooling and have a dedicated AC unit which is a step in the direction, but if you are on the fence about whether or not you need a temperature monitoring systems or not, here are some benefits of temperature monitoring that you might not know. 1.) Preventing downtime by alerting when servers and network equipment at risk of overheating. Good temperature monitoring sensors and software will allow you to configure alerts for predefined conditions and will notify key personnel by email or text message if and when temperatures reach predefined thresholds. This ensures that when something happens like an AC unit stops working or heavy computing loads have increased the temperature in the room, that you or someone is notified to take action. Excessive temperature is one of the leading causes for having to replace hardware, and in most cases, it is easily prevented. 2.) Ensuring efficient airflow inlet and exhaust. Placing temperature sensors on the front and back of your server racks will allow you to measure the temperature of the air going in and coming out of your servers. This is important to know to make sure that the cold airflow is not being mixed with hot air circulating in the room, as well as to ensure that the hot air exhaust from your servers is within the proper ranges. Airflow sensors can monitor the presence of airflow into your server room and will alert you if it stops. 3.) Fine tuning your AC to reduce power consumption and increasing energy efficiency. If you are actively monitoring the temperature in your server room, you will begin to notice trends and baselines. By looking into this data, you should be able to see if your AC unit is able to keep up with the load and if there are cost savings to be had. Many times room temperature will be set lower than is actually needed in order to compensate for not knowing exactly how effectively your servers are being cooled. Along with room temperature sensors, specific rack mounted temperature sensors will give you much-needed insight into the effectiveness of the AC unit cooling your servers by providing temperature measurements of the cool intake air, and the hot air exhaust separately. This allows you to make sure proper temperatures are being taken in, and the temperature coming out is within acceptable limits. If your server room’s ambient temperature is around 64ºF and the intake air and exhaust air of your servers are well below the 80ºF recommended high then there may be room for you to optimize as you may be cooling too much. Using your temperature data you can begin to test and optimize your server room temperature by incrementally increasing the temperature over time to find that sweet spot for better energy efficiency. A degree or two can make a large difference in cost when considering the 24/7/365 running times for your AC units. The mark you are trying to hit will be around 75º with relative humidity between 45-50% which is still below the 80F recommended high from the ASHRAE. Make sure to take a wait-and-see approach as the differences will take some time to manifest and you do not want to make these changes too quickly. Your temperature monitoring software should be able to show you the slight increases in temperature as you optimize your cooling which will allow you to see a new maintained baseline level. 4.) Server Room planning and scaling. Using the temperature data collected from your temperature monitoring sensors you should be able to understand the cooling loads and airflow distribution of your current layout. You can now use these insights to help plan for the additional heat load of adding new equipment and how to maintain a proper layout for best airflow. By taking into account your electrical consumption for the AC unit to cool your current server room configuration, you should be able to determine what is needed if any to scale the cooling of your room to add additional server racks and devices. If you are in the process of planning or scaling your server room. Check out our Free Server BTU Calculator to help you plan your A/C Cooling and Server Electricity costs. I want to know my electricity and cooling costs. Last but not least, monitoring your server room temperature and ensuring that it is maintained within the proper temperature range will help extend the lifespan of your equipment by preventing excessive temperatures going unnoticed which will cause unnecessary wear on your equipment. Even if it is not immediately apparent, short spikes of excessive temperatures can reduce the reliability and can lead to hardware failure months later. Unplanned downtime from hardware failures usually happens at the most inopportune times, and lead to larger issues such as added labour to replace, and potential lack of service to your employees or customers who rely on these servers to be productive.